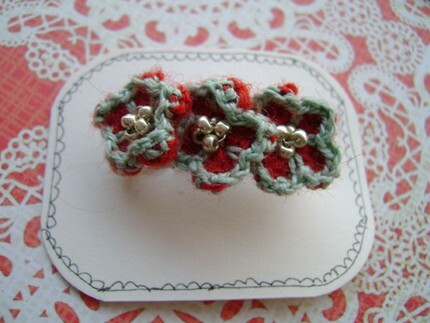 today i am crocheting little flowers getting ready for my art group tonight. we are making crochet flower necklaces like the one lori gardner made. (i'll link to her photos when she posts them) she wore it to art group one night and stunned us all. i almost gave up with the tutorial today.... the lighting was too bright, the yarn was too fuzzy and my camera wouldn't focus, i forgot to ride my bike up to the school to pick up the kids. (the little voice on the phone- mom, aren't you coming to get us?) does that spell mom failure with capital letters or what? then there is that voice asking why are you doing this again? then everyone got home, we had a bit of a snack, and my project didn't look so awful any longer. i took a few more photos and had to be out the door. the last week of school is a killer for sure. are you feeling it? 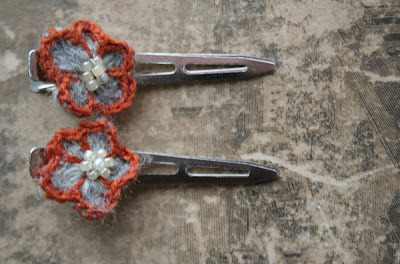 these are the little cherry blossom flowers my daughter marina uses to make the hair clips and pins in her shop. i think they are so sweet. i wanted a tiny project to fit in my purse this summer that i can do anywhere. 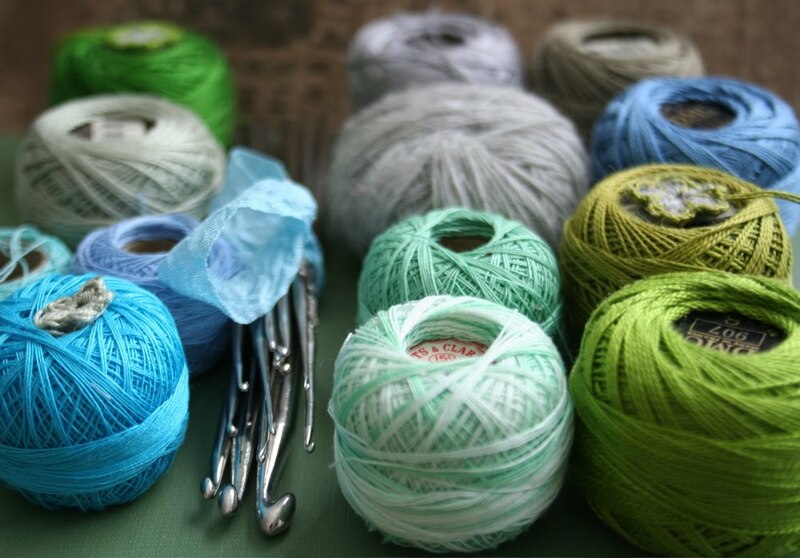 this is it, all you need is a size 10 crochet hook and some #8 DMC cotton perle or thin yarn. 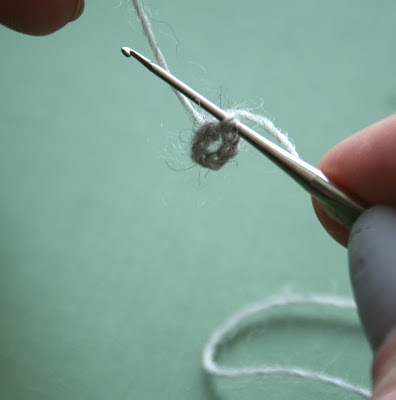 a pair of clippers in your purse will even cut the thread. i was given a bag of crochet hooks, threads, and patterns that were my grandma beaulah's after she passed away when i was 16 years old. i love using her old metal crochet hooks now, having one in my purse will be a little memory of her. *note* this isn't a step by step crocheting tutorial for someone that has never crocheted before in their life. if you need a bit more help check this youtube video tutorial out. step 1. make a loop and chain 7 stitches with inside color. 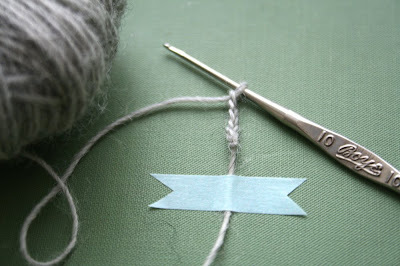 step 2. slip stitch to join circle and chain one to begin round one. step 3. you are going to crochet 5 petals around the circle. 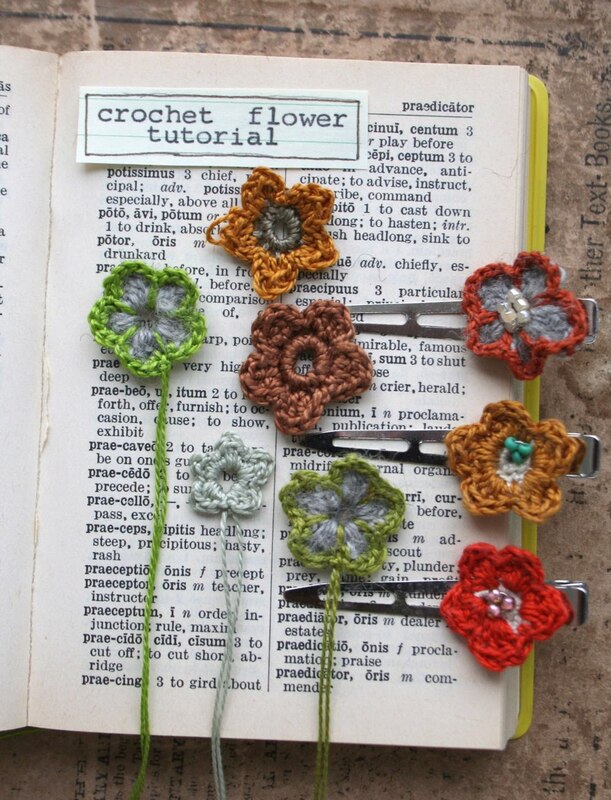 the pattern for each petal is this: crochet one single crochet through the circle you made(sc). 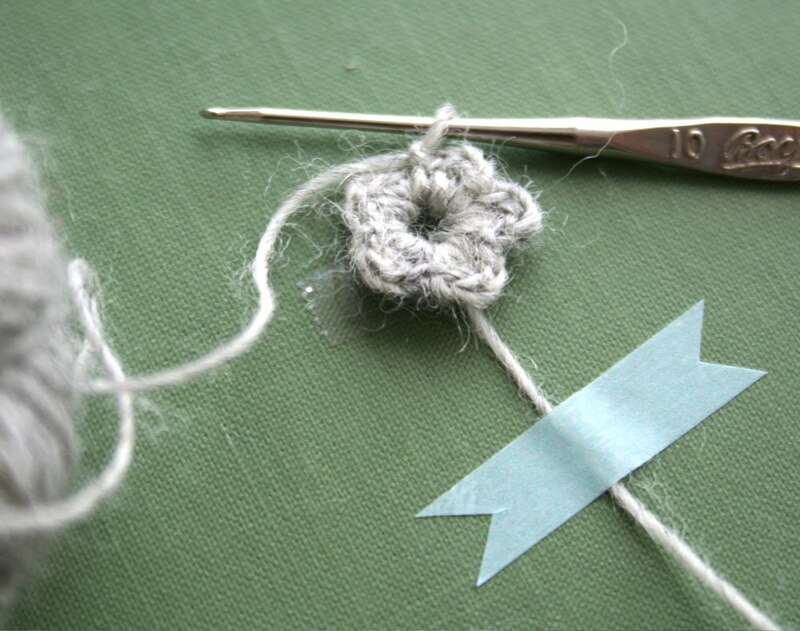 double crochet (dc) 2 times through the circle, then single crochet(sc) again through the circle and finish the first petal with a 1/2 crochet through the circle. the pattern would read r1 sc dc dc sc 1/2c. repeat this pattern for each petal 4 more times. step 4. slip one stitch to join round one. clip thread and pull through to tie off. step 5. round 2 begin crocheting with outline color. 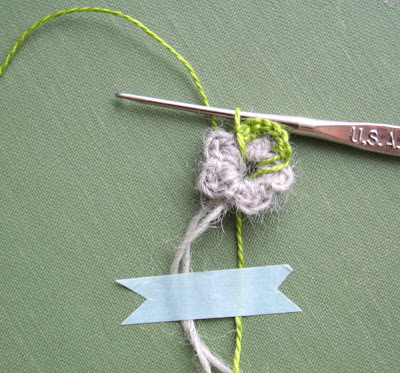 join thread and single crochet through the center. this is the stitch that will shape each of the 5 petals so keep this one snug. step 6. now single crochet around the first petal with your outline color following this pattern. single crochet once in the first stitch, single crochet twice in the second stitch, single crochet twice in the third stitch, single crochet once in the fourth stitch, single crochet through the center and begin second petal. continue crocheting around the remaining four petals following this pattern. 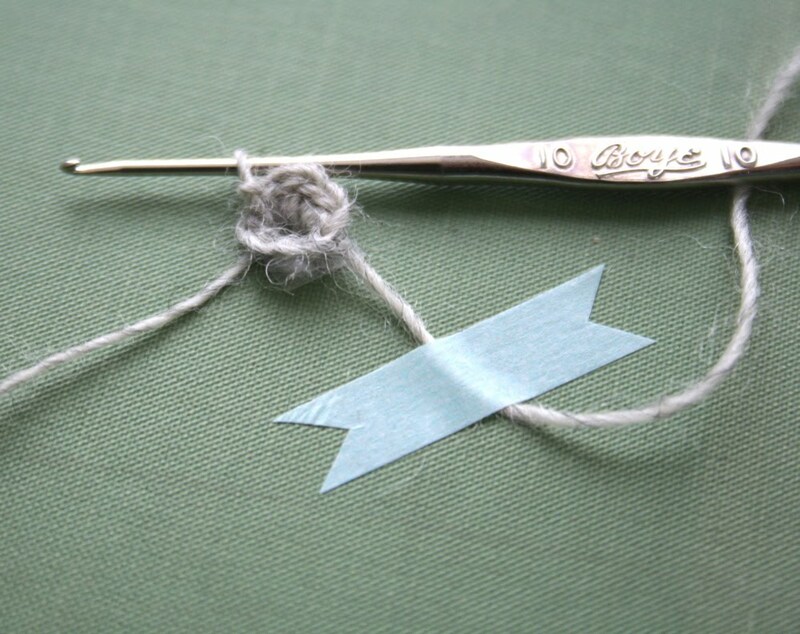 step 7. slip one stitch to join round 2. clip thread and pull through to tie off. 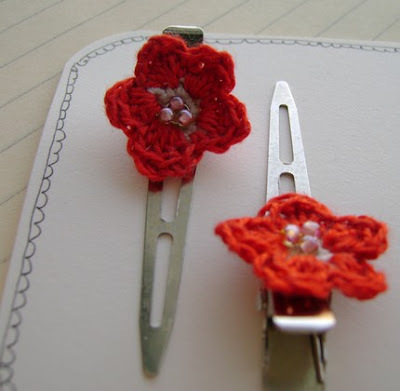 use a large eyed needle to hide the thread ends on the back of the flower and clip off. 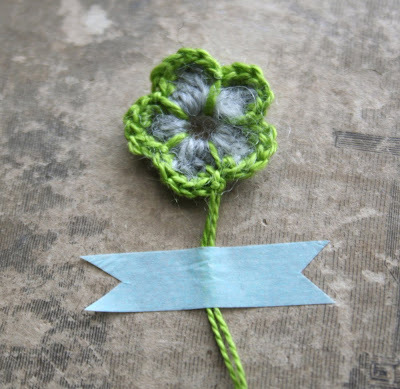 your first little crochet flower is finished! today for my artful thursday i went shopping for some art nest inspiration. candice and i are designing the mailers we will be sending out next week. 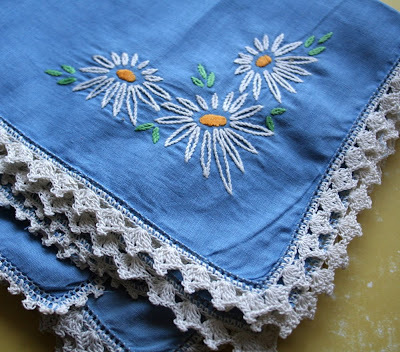 i found these sweet daisy napkins that i plan on using for the envelope edging. 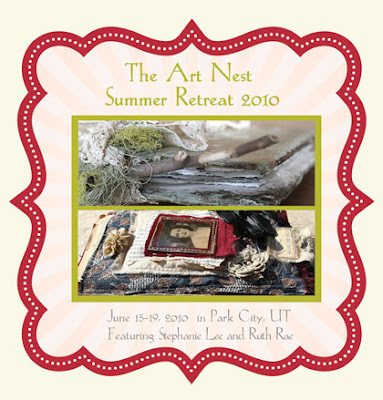 we'll use the hand crocheted edging instead of the paper lace we used on this one we made when amy hanna and pam garrison came the the nest. 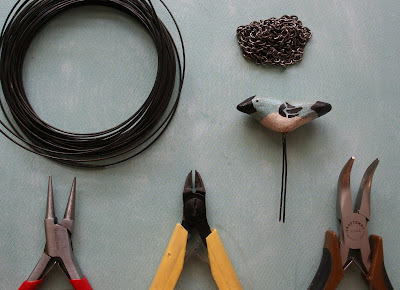 here are a few of the things we bought at anthropology to use at the cabin and for color inspiration. 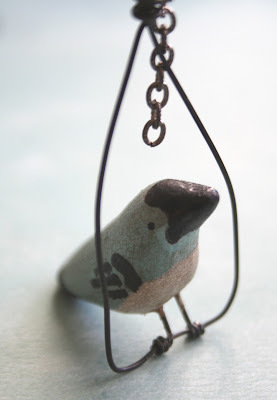 you will only need some inexpensive 20 gauge craft wire, wire cutters and pliers, some junk chain from a broken necklace, and your paper clay bird from last week. tools left to right: beadsmith needle nose pliers , lindstrom flush cut wire cutters (totally worth it! ), and craftsman bent nose pliers. step 1. cut a piece of wire to form a 3 inch circle. twist the ends together. step 2. cut 3 pieces of wire 11 inches long. 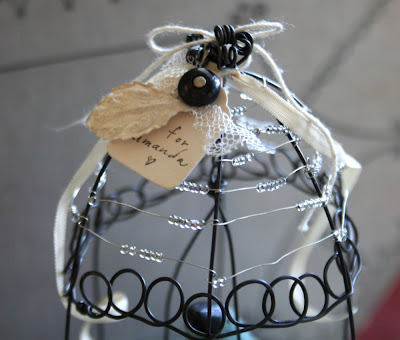 these wires will form the dome of your cage. 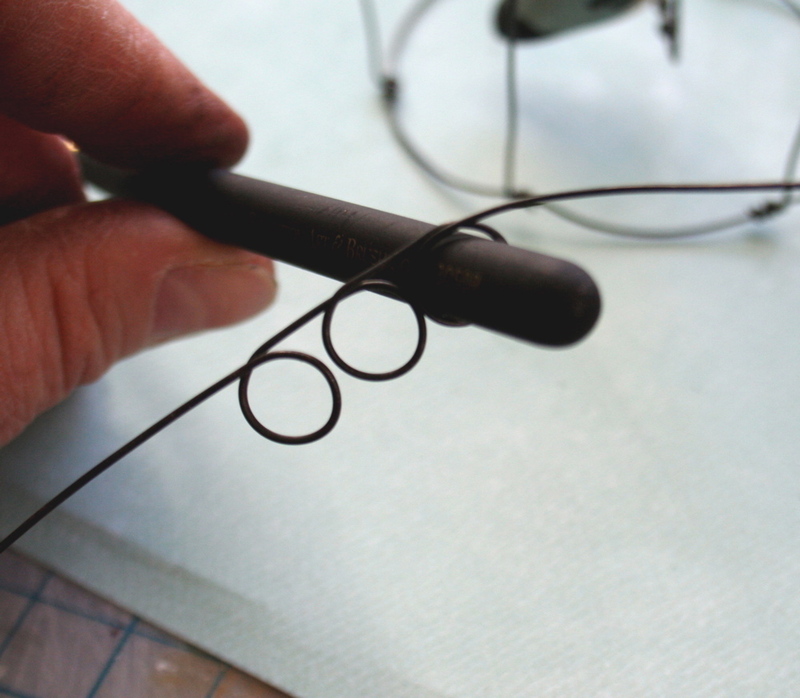 twist the end of your first wire around your circle and crimp tight with your bent nose pliers. this will keep your wires from sliding around your circle. now twist the other end of your first wire straight across on the circle. 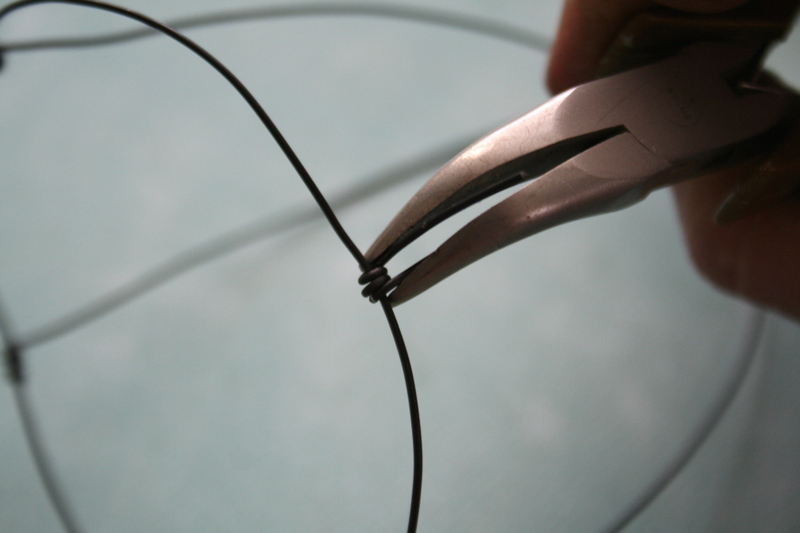 step 3. attach the other two wires following this diagram for the placement of the six wire ends around the circle. 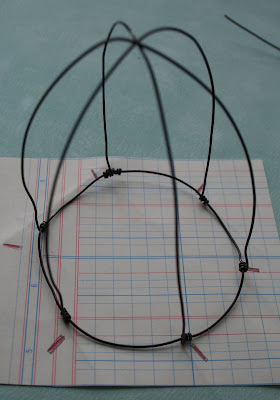 step 4. to make the swing cut a piece of wire 8 inches long and shape it into a gothic arch. hold your bird inside to be sure she will fit comfortably. twist one wire end around the top of the swing to secure. make a wire loop with the other wire end using your needle nose pliers. 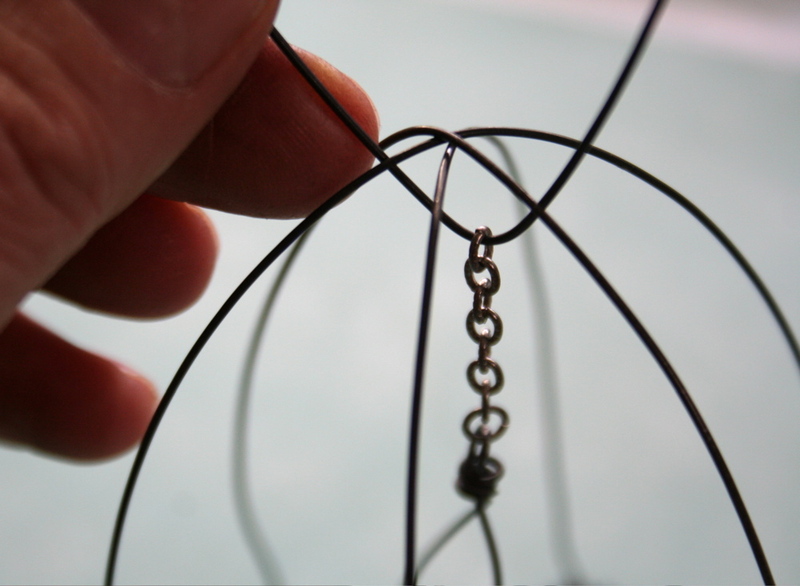 thread a piece of chain on the wire loop and then twist the wire end around to secure and clip off excess wire. hold the swing inside the cage to measure how long you want the chain. mark the chain and clip. 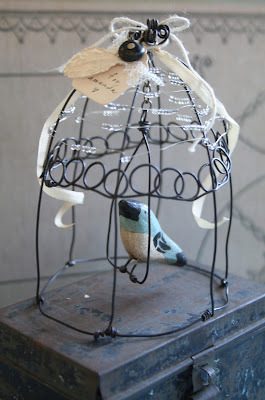 step 5. now attach your bird to the swing. 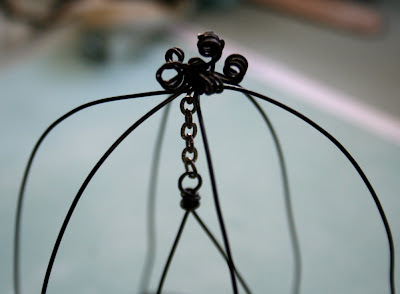 wrap one leg wire around the swing. 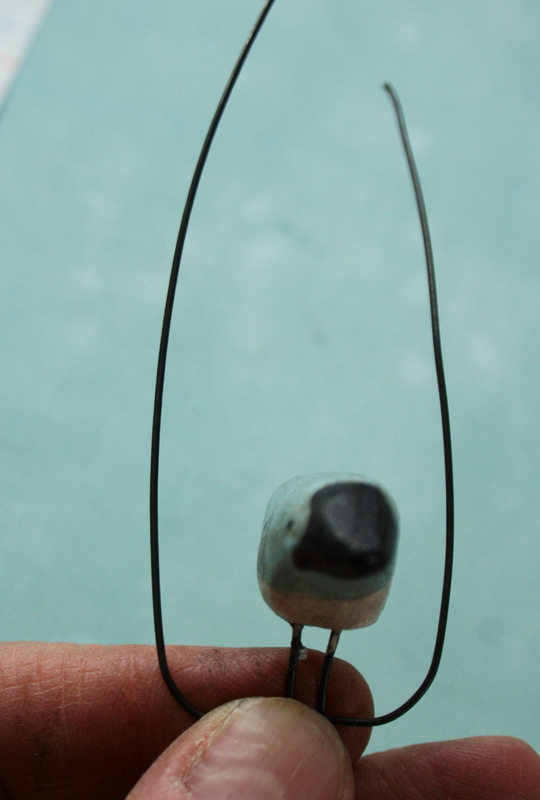 the wire legs are short, only about 1/4 of an inch long after wrapping. 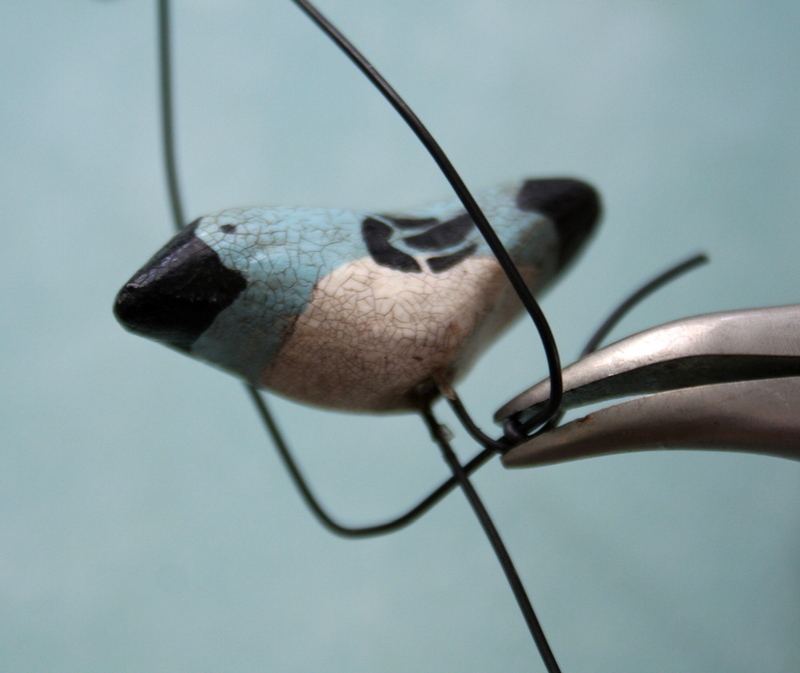 to be sure your bird doesn't slip forward on the swing crimp wire to secure and clip off any extra wire. repeat for the second leg wire. 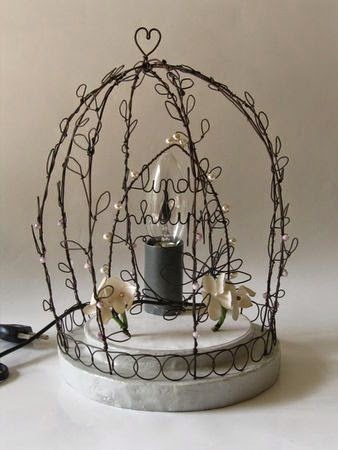 step 6. to hang the swing from the top of your cage cut a 4 inch piece of wire and bend it slightly in the center. 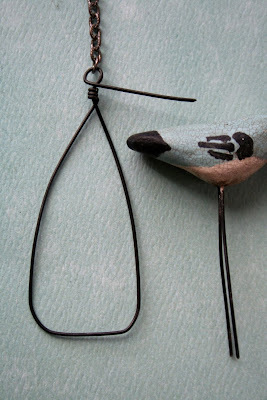 slide the chain attached to the swing onto the wire and let it fall to the center bend. 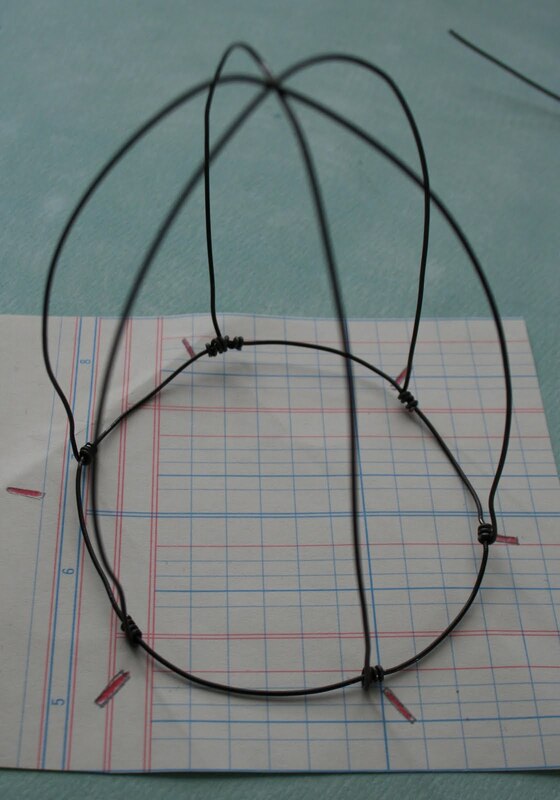 slip one end of the wire under the top of your cage where the 3 wires cross right in the center. twist the wire ends around to secure the chain for the swing. with your needle nose plier curl up the wire ends. 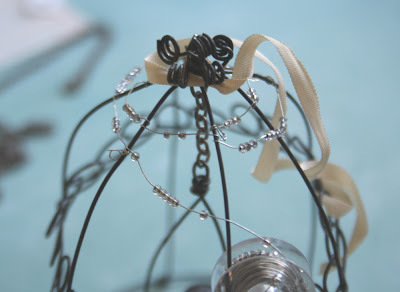 twist two more wires around the top and curl up the wire ends for a total of 6 curled up wires. 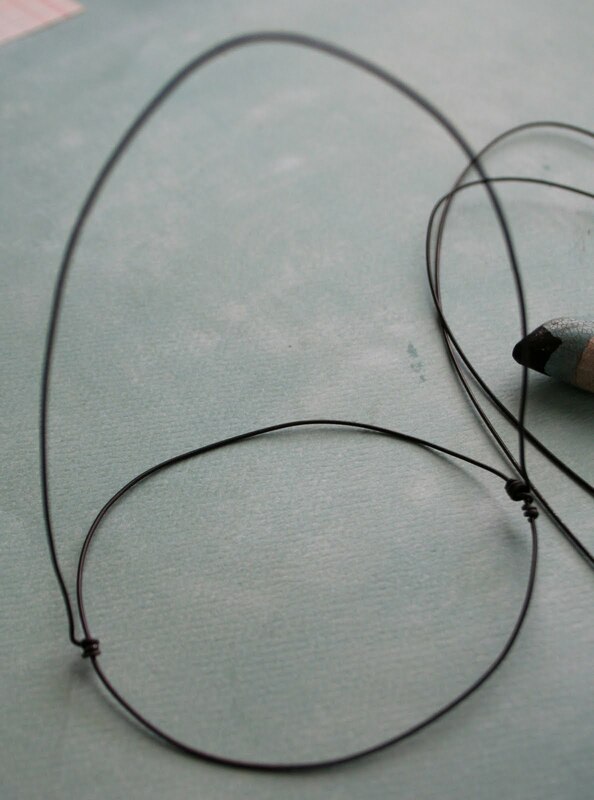 step 7. to make the wire loops twist the wire around a paintbrush, remove the paintbrush and place it next to the loop and wrap the wire around the paintbrush again to form another loop. 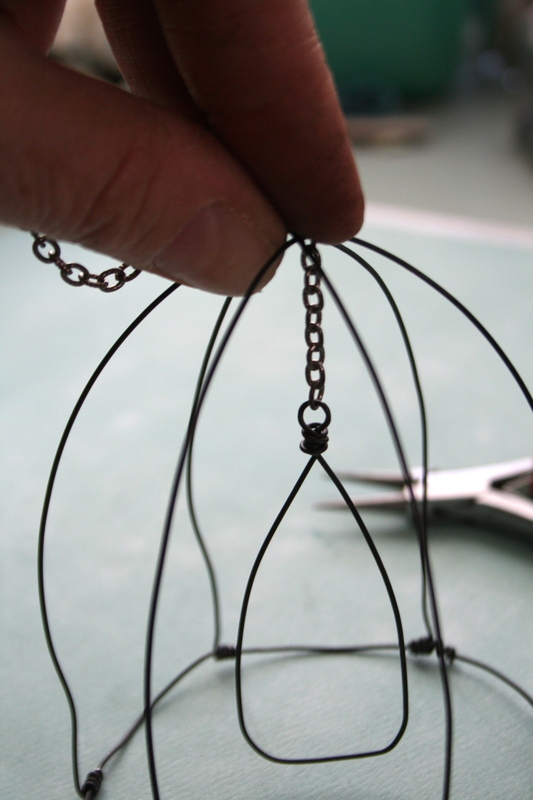 keep forming loops until you can make a circlet of wire loops that will fit around the top of your cage. 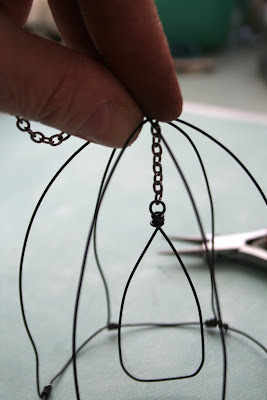 working with wire forms will cure you of any perfectionist tendencies... i try to shape the wire so it is fairly even and symetrical, but there is always a bit of wonkiness about it, i think this just adds to the handmade feel of your piece and give it a lovely charm all its own. now it is time to add a bit of fun if you like. 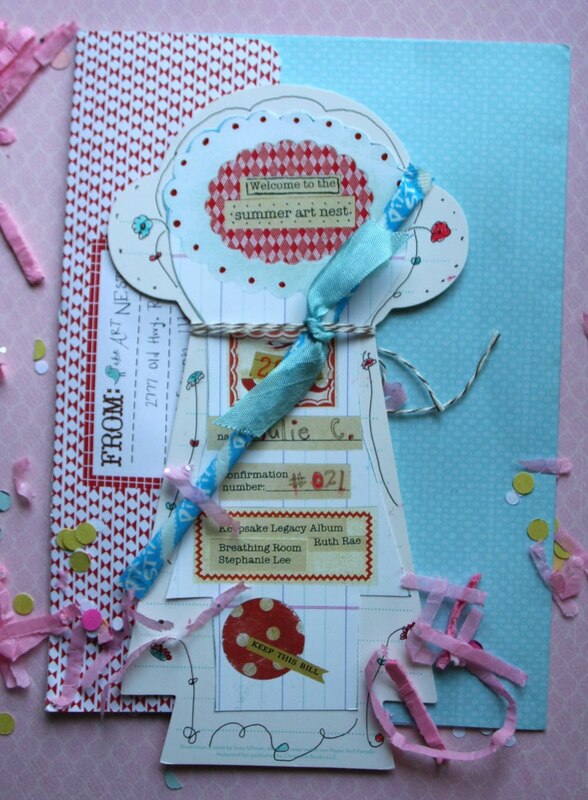 i tied some of vintage ribbon around the top and let it curl down both sides. 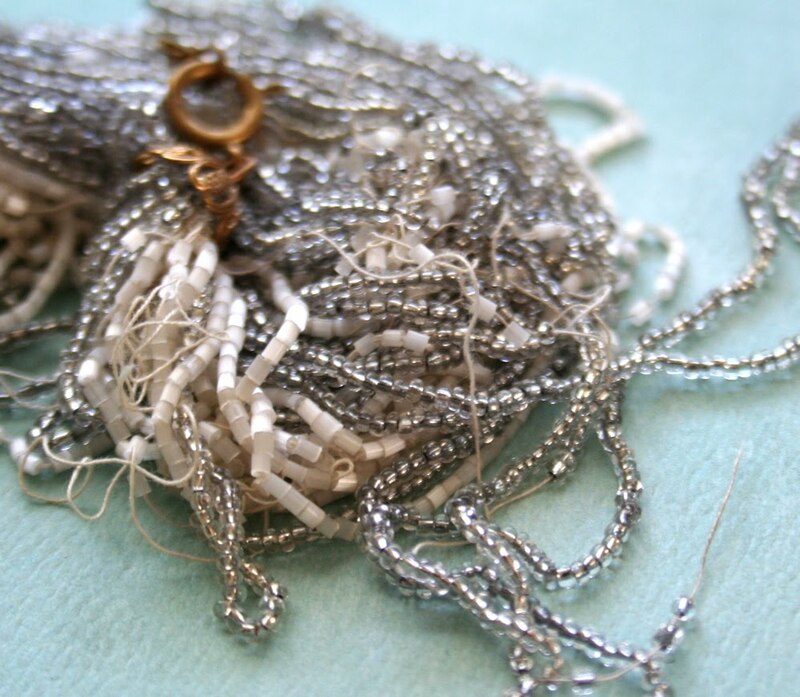 i threaded silver lined seed beads on a spool of very fine silver wire and wrapped it around the top of my cage leaving the beads to slide along the wires for some sparkle and a little movement. the beads came from this broken vintage necklace. 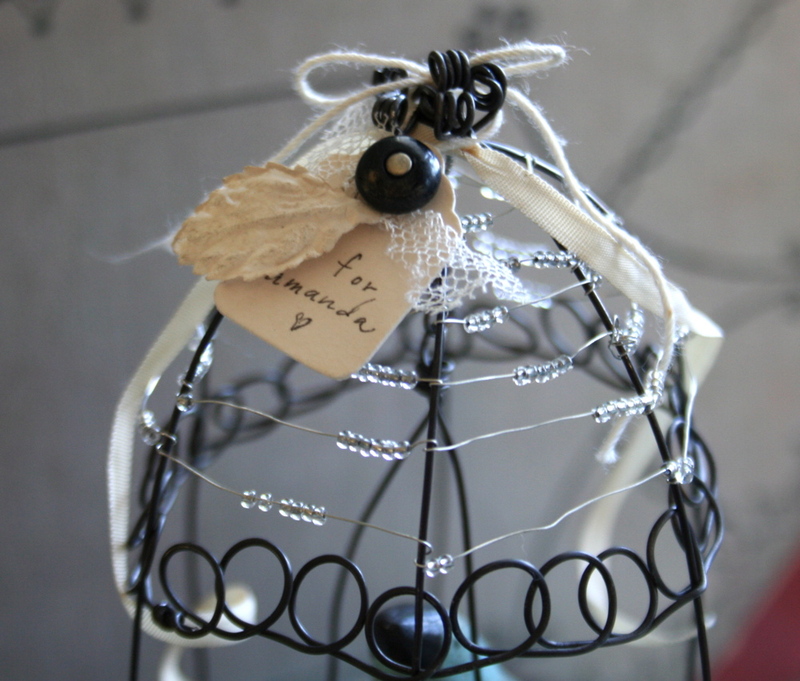 here is a close-up of the wire loop circlet in place and the beads strung around the cage. the paper tag is the final touch. i removed the string from the tag and slipped a vintage button with a wire loop shank in the hole at the top of the tag. then i tied the string through the button shank and tied a strip of tulle around the button and curled a painted paper leaf around the button as well. 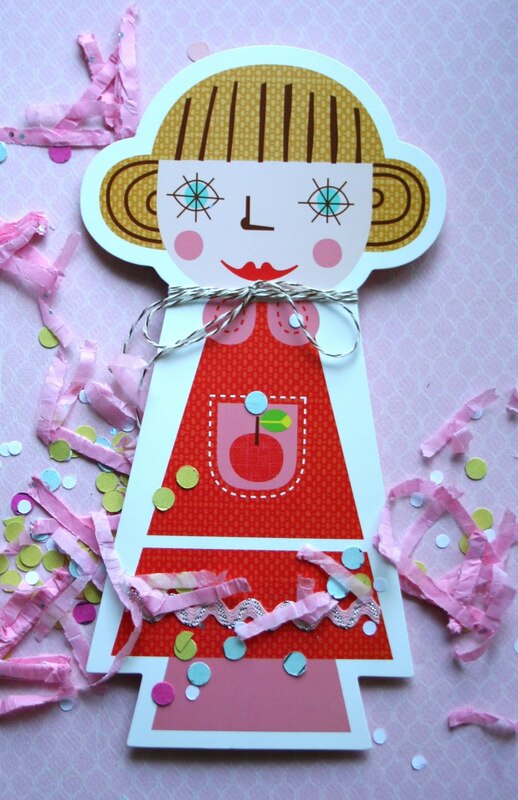 a lovely gift for someone very special.